Successfully Added PS/2 Professional Keylogger (2MB Ghost Edition) to your Shopping Cart. PS/2 Professional Keylogger (2MB Ghost Edition). 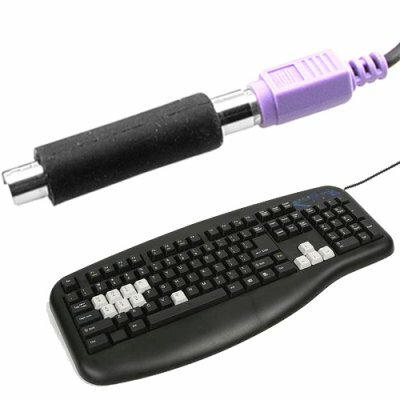 For your professional computer surveillance needs, Chinavasion is proud to present a discrete, high-grade key logger. With today's concerns and worries, it is important to achieve cost-effective peace of mind. Designed for home and work use, this keylogger is a discrete and professional-grade computer security solution, giving you an extra layer of computer protection: protect your child while they are in internet chatrooms or see if someone is using your computer while you are away! Completely undetectable by security software, this keylogger is easy to setup with no drivers or software required. Simply install the device at the rear of your computer system between the PS/2 port and the PS/2 keyboard to act as the bridge. This enables it to effortlessly intercept and record all the keystrokes made on the keyboard. This PS/2 hardware key logger comes with a massive 2MB of memory for covert surveillance of what is being typed on a computer. With a spacious 2MB of onboard memory, this device gives you peace of mind with enough capacity to record over 2 million keystrokes - equal to over 1,000 pages of text. The menu UI gives you easy access and password control over the keylogger. Note: Please check your country's law in regard to computer surveillance before you import this item. You are responsible for your usage of this product: please use it legally and ethically! Achieve peace of mind with this personal security device. If you suspect someone is using your computer without your authorization, this device is perfect for monitoring your own PC while you are away from your desk. What's more, it is also great for data backup as it creates a complete record of all your keystrokes. NO. Just plug it in and it starts working instantly. on 2010-02-12 19:38:50 good product! but I lost the manual! Great product but it would be even better if there was a USB version because most of the keyboards in our office are USB.